On Saturday night, someone told me that she wanted to be me for a day. I imagined this friend running around my house like an over-caffeinated chicken with its head cut-off. I laughed again for a different reason. Wouldn’t it be great to walk in someone else’s shoes for a day? Yes, you can read what I write, but I can only give you a small slice of my day. If I had that much time to write, I would have nothing to write about. Even so, my high school friend recently told me that, after reading my work, she felt assured that I haven’t changed. She knows me well enough to not want to be me for a day, but only our children see anything close to the whole picture. What does my day look like? I am just a mom. The details would bore you. In the past few weeks, my agenda for next year has congealed into a thick and sticky plan. Without considering my writing on line, I have accepted four very different hats to wear. I should mention that I have rejected two others formally, and ducked and dodged other such responsibilities. Each year I hope to hang a few more hats on the hook, and each year I am thrown a few new ones, greater challenges, bigger honors, something new. Swept away in the tide of possibilities and challenges to overcome, I don a few hats. I comfort myself by knowing that I am a better person when I am engaged. The power to improve my world, even by the nose-nudge of a puppy, propels me forward. I imagine that by my example of achievements my children will thus achieve. As I strive to see the world through their eyes, the world they know best now is the one I bring to our doorstep. And, then, I remember Ted. Once again I am humbled. I am glad she wasn’t in the room. She knows that I used to get paid. She knows that women can do whatever they want (and should do it without hesitation). She knows what I do all day now. She even knows why I go to meetings, and how I try to make a positive impact on the world. Somewhere along the way, I forgot to tell her that she shouldn’t be proud of being a mother. I probably even forgot to mention that it isn’t considered the most important job in the world. She probably doesn’t know that. She sees more than a small slice of my life. I am her definition of ‘just a mom.’ I guess she wants to be like me for a day too, or maybe even longer. Maybe I shouldn’t have laughed so easily. "Sometimes life isn’t as good as it seems." 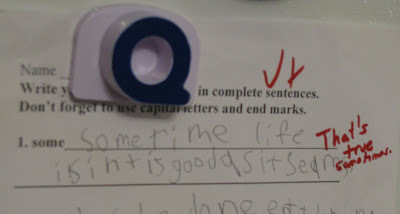 At 6 ½ years old, when asked to use the word “some” in a sentence, that is what my son wrote. It has been on my refrigerator since Monday. As “mother” my job is to do precisely that - to make my children’s lives seem better than they really are, at least by some of societies measures. There is a story of a mother in a refugee camp, spreading a burlap sack on the ground. She required her children to say prayers and use their manners at that new burlap dining table. You could interpret her actions many ways. By her breaking bread with loved ones, and her graceful ability to elevate that event, she succeeded in making her family’s life seem much better than society would have gauged. My job should not be hard. I recall my family’s occasional vacations – the plush transport (a Dodge wagon), the fancy hotels (Holiday Inn – at the top end), and highbrow entertainment (a deck of cards on that queen bed). Dad would sneak out early and return with a donut for each of us. He knew our favorites. Life seemed perfect then. In my 20’s, traveling internationally in business class, I could look out into the foggy clouds over the Pacific Ocean and know that, by so many measures, my family’s life wasn’t so good at all. It had just seemed good, seemed perfect. Even with fond memories, I was pleased to be free of such naïve notions. In my 30’s, I became a mother and held my first-born in my arms. I remembered my mother telling me that the first newborn she ever held was my oldest sibling. For me, it was no different. I held my first newborn, my firstborn, and her story moved from my memory and lodged in my heart. It became my turn to create a world for my family. With a little creativity, I could make that world whatever I wanted it to be. As the years go by, the fog lifts on my own childhood. Life was never as good as it seemed. By society’s measures, we are better off now. I reinterpret memories. I create a similar world for my own children, allowing them to accept certain illusions. I let them discover society’s measures in their own time. Now that I am approaching 40, I see my children’s personalities blossom. I hope to give them the tools and the creativity to make their lives seem so much better than society will ever gauge. I want them to keep their feet on the ground and yet see through the clouds. As the foggy edges of their experiences expand, I hope life always seems better than it really is, even as their ability to distinguish between what seems to be true and the truth sharpens into focus. The good life that seems true comes from the heart. It seems they aren't so important. My children love to play with rhymes. They play the ‘rhyme game’ as often and as spontaneously as ‘I spy’ (which in our house is endless). In case you aren’t familiar, our version involves someone yelling out a word. Then, everyone has to find another word that rhymes with it. Generally, we go on and on until many have been repeated. (Unless the word is something like “lasagna.” In which case, “Kenya” is the only answer and we all call ‘pass’ and the giggling is contagious). Then, the next person has a turn. On Saturday, all five of us were enjoying the game as we prepared dinner. After deciding peppermint rhymed with government, I thought we needed to get back to basics. “What happens when you rub your elbow on bricks?” my husband said helpfully. “How many fingers?” he helped again. There was a little pause here. “What does THAT mean?” I asked shaking my head (as if it wasn’t even a word). “Oh, a horr-or film?” I helped. “What does a donkey say?” my husband continued cheerfully. I sent Andrew to school with nine dollars for the Scholastic book fair. The books are normally just a few dollars each, so I felt he would be able to choose two or three books. I gave him no instructions, but wondered to myself if he would come home with some selections for his two younger siblings. I hoped that he would do that without my encouragement. He has done it before. I looked forward to showering him with praise when he returned home victorious. He leapt off the bus with a huge smile on his face that afternoon. He was brimming with joy. He couldn’t WAIT until we got all the way home to show me what he bought. He did not buy a single book. Well, except for the one with the pop-out paper cars, which barely has any instructions to read. I was incensed. Anger might even describe my reaction. I didn’t show it. “Wow, Honey. That is some poster. It was $4.50?” I looked at it nodding my head to disguise my sadness. It wasn’t even a full-sized poster, and had been quite damaged on the way home on the bus. I wasn’t sure what to say, so I said nothing. I ranted and raved internally. All I could think was that my child had no idea of the value of money. He wasted $4.50 on this ridiculous poster. He talked about it while we ate our snack. Then, he ran upstairs with it. A few minutes later, he beckoned me upstairs. I walked in the room and saw my son’s very first big kid poster hanging on his wall. The black and purple poster hung right between his sister’s dresser and the childish stoplight we had bought for the room when Andrew was two years old. It was hanging on his wall, not my wall. It isn’t a pin-up. It isn’t a potty-mouthed rock band. It is just a car. Seeing the black-background poster hanging on my son’s wall all the sudden made the whole room grow up. The fire engines on his comforter laughed at me. The sweet, little boyish watercolor of a helicopter hovered on the wall like a lonely spring bird that forgot to fly south in the fall. Reading is Andrew’s favorite subject. And, when my children see full bookshelves with ‘nothing to read,’ we visit the library. I wouldn’t dare deny my children books. Books in our house are like sand on the beach. The poster transformed his room in a way I could never imagine. It is something “permanent” to him, not like a book that is read and finished. Books are free at the library. The poster seemed valuable, well worth the $4.50. It is his poster, on his wall, in his room. It is a sign of age. I’m just not sure if I’m old enough yet. On Sunday, I was a peasant’s wife. It wasn’t exactly intentional. About the time I sat down to make my weekly menu and grocery list, my husband announced his list for the Home Depot. The house needs attention. Houses are like that. As he walked out the door, I tossed my list in the garbage and took another look in my pantry. Saying that there is no food in our house is similar to a suburban teenager complaining that she has nothing to wear. Although I do buy some organic products for my family, I mostly just make meals as much from scratch as possible. I believe that it is healthier, and it gives me flexibility. Out of a bag of flour I make bread, pancakes, waffles, tortillas, pasta, corn cakes, roux, and, well, you get the idea. I have been trying to reduce our pantry over the past few weeks, but could I still make dinner without having been to the store in a week? I took it as a challenge (everything is either a challenge or a compliment in my world – I’m a simple girl). I started with vegetable stock. I had carrots, celery, a couple of half-onions (one was red, who cares), dried herbs, and a few other leftovers. When the stock was simmering, I found a very scrawny 4-lb chicken carcass in my freezer. I threw it in the pot anyway. The leftover bowl of oatmeal on the top shelf of my refrigerator became oatmeal-molasses bread. I was short molasses, but threw in some brown sugar. Andrew made it while I cleaned the kitchen. My kids like noodles. The laziest and most high-protein way to make noodles that I know is called spaetzle. Basically, three cups of flour, four eggs, milk, a little salt and pepper and you just boil them in little drops. We call them “crazy German noodles.” They gave substance to our soup. Dinner was on. Just after I put the bread in the oven, my family decided we should go to the park. The weather Sunday was absolutely perfect – the first perfect day since sometime in 2008. The freshly laid fertilizer in the yard prevented my children from enjoying our rusty swing set. I looked at my husband. “That’s okay, Mom. Just bring the dinner to the park!” Andrew chimed in. They always have an idea. Eating outdoors is hardly foreign to our children. “Okay. Go. I’ll be there in 30 minutes.” They were in the car before I finished my sentence. I brought our soup and bread to the park. The bread was hastily wrapped, still warm, in a kitchen towel. I grabbed a tablecloth, some bowls, spoons, and sippy cups. The children were thrilled. My husband relaxed. I sat down at the picnic table and enjoyed my full meal. The chill settled in quicker than the sunset, and I admit I would not have lingered at the picnic table alone. But, with my warm soup and my hungry children, I did linger. I shoved my cold hands in my pockets and looked up at the broken clouds, knowing they floated over our roof every night, unnoticed. I smiled at our ‘peasant’s’ meal, knowing too well we had truly eaten like kings. We live like kings. The soup warmed my core. Their unfettered laughter warmed my soul. I slowed down last week. The jury remains out on the true impact of these changes. Spending extra time with one’s brood and cleaning the house with greater zest likely improves our overall lives. But, next month I will shout out in favor of allowing my extroverted nature to blossom. I will extol the virtues of engagement in the community. I will accentuate the need to show our children that their mother is more than a cooker, a cleaner, and a craft organizer. Last week, I sat down and worked with Playdoh. The attention span of my children never ceases to amaze me. George continued with his projects for over two hours, without any interest in further distraction. Gladys took the occasional break, normally because I would allow myself to quickly throw in another load of laundry. We played with Playdoh for two hours. A person can do a lot in two hours. The roses do not take very long at all, only a few minutes. For a few moments, I even wondered if mothers across the country had been making roses out of PlayDoh all along and had just never told me. After all, they are kind of pretty in a Dr. Seussian sort of way. Then, I came to my senses. If you would like to make them yourself, I describe the process over here. If you think a prolonged lack of sunshine has resulted in dangerously low levels of Vitamin D that is ultimately causing short-term delirium, you might be right. If you think I should get out more, you are definitely right. Phew. Just in time for Spring. We attended our son’s Cub Scout “Blue and Gold” banquet this week. I brought an extra large crockpot device full of red sauce pasta with sausage to the local elementary school. I felt like a mid-Western sahm in ways I had never before experienced. 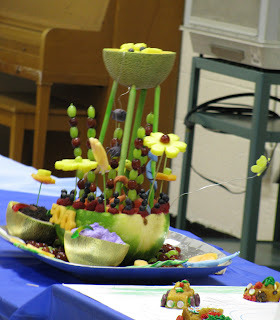 A few days prior, my husband informed me that the children of my son’s den were to create a dessert for this event. They would get together at our house the evening before and make it themselves. “It’s all about the kids learning to do it themselves,” he said. In a sort of off-hand way, he told me that two of the other mothers (who I know, of course) had said they have an AWESOME idea for THEIR den, but it was a secret. We would go with a pinewood derby theme. 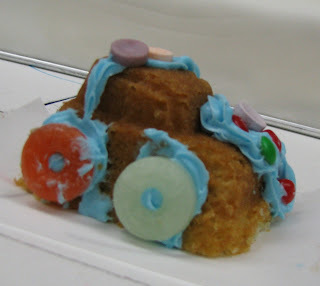 The kids would each make a ‘car cupcake.’ I happen to have a ‘car cupcake’ pan, so that was too easy. That’s what we did. I made some cakes ahead of time, but my husband had the boys make cake from scratch. While theirs were in the oven, I pulled out my already-cooled-off cakes for them to decorate, FoodNetwork style. We had fun candies and spray frosting – the kids did it all themselves. For the sake of presentation, the kids drew their own “race track” on poster board on which to place the cars. Perfect. I was feeling a little guilty about it, but I went ahead and made a sheet cake for the centerpiece from the leftover cupcake batter. 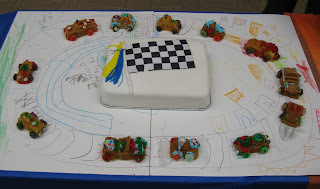 The checkered flag and tassels in the picture are all made out of fondant. I tried to keep it simple. I restrained myself. This was all about the kids. We let them be creative and messy. I sat on my hands while they worked. We quickly set up the dessert at the elementary school, and went to sit down. One of the mothers I knew came in with fruit. Fruit? It felt like a good fifteen or twenty minutes that those three or four parents were working on constructing this elaborate fruit display. Seriously. This thing had several levels, fondant snakes, dirt cake for dirt – impressive for sure. I tried not to watch. My brain had this argument. Thank goodness, I thought. I could restrain myself. I’ve recognized my competitiveness and overcome it. I’m a good mom. And then, one of the dads from our den leaned over. “Yeah, well, the gloves are coming off next year,” I nodded slowly. Well, not really. It will be all about the kids next year too. And, next year, I will squirm in my seat just as much as I did this year. It is just who I am. You can tell a lot by watching kids play. In fact, with a few quick questions, you can probably find out more than you want. I know this. My mother has teased me about it. You know it’s true too, even if you don’t want to admit it. If preschool teachers talked! On the nicest day we have had recently, I was out front with Andrew and Gladys. 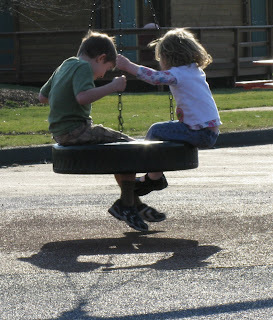 Andrew was the ‘dad.’ Gladys decided to be the ‘baby,’ so that left me as ‘mom’ (it was easy on my imagination anyway). They always do approximately the same thing, and they have been acting out these scenes since they could walk. Andrew runs or rides his bike down the sidewalk almost to my neighbor’s mailbox. He stops there and pretends to be at work. Sometimes, he will even ‘call’ me at home (we are still close enough that we can hear each other on our ‘phones’). After he briefly pretends to work on an invisible computer, he heads home. And, we proceed to have approximately the same conversation we have had for about four years. I try to mix it up sometimes, but it doesn’t really matter. They pretty much want to have the same conversation every single time. (I think we just all enjoy the kisses.) But, this time, the conversation was just a little bit different. Fortunately, his daddy is still working, but some of his friend’s dads are not. It is reality, but does it have to be imaginary too? So, this morning, when I was in the shower with Gladys, I decided that I wouldn’t post about my son pretending to be fired. I was imagining so many other topics that I might post about, when Gladys interrupted me. Of course, just when you think your children have a clear picture of reality, you get a really fabulous story. After preschool recently, Gladys told me that one of her teachers put whipped cream in the shoe of the other teacher. And, after running around barefoot, the shoeless teacher proceeded to eat the whipped cream. I can only imagine what she tells them about me. 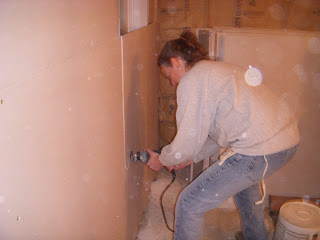 For some reason, seeing this picture of me filling my lungs with someone else's drywall dust seems refreshing as compared to a pint of lint. If you would like to read what I wrote about it, you can check it out here. I promise I won't write about housecleaning again, at least until Easter. I endeavor to progress my home towards a state of perpetual cleanliness. I find it difficult to progress. My best analogy would be pushing a rock up a never-ending hill. (Yes, this is a well-used analogy, generally associated with one of the deeper pits in Hades). And, yet, gravity must be fought. The rock must continue to progress towards the summit. In a comment on my “Lenten Observance List” post (LOL), a friend recommended that I consider engaging the Flylady. I am familiar with her. I recently found her book, which was lent to my by Indy almost exactly one-half decade ago. Her techniques and ideas are excellent. So, in spite of the fact that my losing the book in the first place was beyond a little Freudian, the dear Flylady could bear no blame for my present situation. I signed up for her e-mails. Now I remember. I remember exactly why I lost the book. The truth is, I don’t need to learn to F.L.Y. The Flylady suggests that by progressing towards the clean house, the happy housecleaner will learn to F.L.Y., which means Finally Loving Yourself. For me, this is like sending someone with a weight problem to an Alcohol Anonymous meeting. I love myself just fine. In fact, if it is true that I will love myself MORE with a clean house, society should appreciate my disaster as it probably benefits from this appropriate dose of humility. I read a testimonial in a Flylady email this morning, in which someone admitted that they finally got dressed to the shoes and stopped craving Little Debbie cakes. I am happy for anyone who succeeds in a personal struggle. This, however, is not my struggle. And, well, it got me thinking. Another Flylady mantra is CHAOS. CHAOS translates into the ‘Can’t Have Anyone Over Syndrome.’ I understand this conceptually. I do clean my house in a panicked sort of way before certain visits. But, those who visit me regularly know that I have people over regardless of my home's preparedness. You can walk into my house any day of the week and I’ll gladly make you a cup of coffee and sit down with you in the least cluttered area. And, if I have something to offer, you’ll leave with a little banana bread, or a hand-me-down dress for your daughter. If I am making dinner, I’ll pull up a chair so you can talk to me while I finish sautéing the meat and I’ll make sure an extra plate is set for you, but I’ll never, ever tell you not to come in. And, that got me thinking too. Dear Flylady, please add an addendum to your excellent book for folks who have these other dysfunctions: "excessive" self-esteem and an "under-developed" sense of shame. About the same time that I borrowed the Flylady book, a different friend told me how she desperately disliked picking up the toys after her toddler. As soon as she put them away, the child would have them out again. I explained to her that the goal was not to clean the floor, but to ‘reset’ the child’s activities. A toy on the floor is less likely to be used. So, by ‘resetting’ their toys, you are encouraging additional play, which will improve their overall development and thus is an important part of parenting. In effect, you should feel GOOD when they pull the toys off the shelf, because that is exactly why you (and eventually they) put them there. So, that is CRAWL. Constantly Resetting Activities With Love. And then there was CHAOS. I do not have an instinctual need to clean my house. As an example, consider freshly baked bread. Everyone I know loves to have a fresh loaf of bread baking in the oven, and loves eating that bread when it emerges. I consider it well worth my time to make this happen. The time is spread across my day with sessions of rising in between. When that bread emerges, I never question the time I spent baking it. Even when I am cleaning up the last crumbs, I am happy. You may not feel that way, and would be perfectly satisfied with a loaf purchased from the bakery. I also like to have a clean house. However, at the end of the time necessary to make the clean house emerge, I do not feel that it was time well spent. I am not sufficiently satisfied by the result. However, just like you might take the time to buy a loaf of bread at the store, I would likewise not leave the toilets to their own devices forever. What I need to do, then, is to replace panic with P.A.N.I.C., Perpetual And Naturally Instituted Cleanliness. I enjoy theorizing far more than cleaning. Yeah, I know, I could quit blogging and clean instead. But, another friend reminded me that I would probably be so sad that I would start wearing sweats and eating Little Debbie cakes. It just isn't worth the risk. I am wearing a super-hero cape too. Since it is really Gladys’ fancy apron that her aunt made, it gives me a delicate, lacy look around the shoulders, rather sophisticated as capes go. When my kids and I get REALLY serious about cleaning, we wear capes. I think it is appropriate. I feel so much more serious in a super-hero cape. I know I run faster. Sometimes, I’m even sure I can fly. This week is take-no-prisoners find it, fix-it, check it off, and get rid of it week in MIT Mommy’s house. We are getting ready for Summer. Again, the fantasy of wearing a cape works well when trying to imagine ‘Summer’ on a ten degree, windy March morning. It is working. The coffee didn’t hurt either. So far, I am feeling a certain amount of success. If you are looking for statistics, I can tell you there are about six boxes for charity and roughly four bags already put in the garbage. I have cleared the bathtub drain and my husband completed a long list of self-imposed tasks from the weekend. He rocks. Just as I doubted the good sense of this approach, Andrew whispered in my ear. He looked at me. His sister had taken his seat, but instead of bothering her he scooted over by his dad. He heard me.